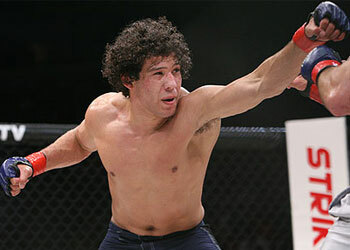 In an attempt to spice up their 2009 debut event, Strikeforce has announced that the victor of this Saturday’s Gilbert Melendez and Rodrigo Damm bout will walk away as the organization’s interim lightweight champ. The card lost a little bit of its momentum when 155-pound champ Josh Thomson was forced to pull out with a broken leg just nine days before gametime. By manufacturing this “title fight,” the organization assured themselves of still having a 5Round affair on the card. This move also guaranteed that, assuming the favored Melendez beats Damm, the organization will still have the opportunity to host the highly anticipated championship rematch between Thomson and Melendez. “Strikeforce: Shamrock vs. Diaz” will be held at the San Jose Pavilion on April 11th. All of the night’s main bouts can be seen on Showtime.